In one of my favorite Sidney Harris cartoons, a dispirited looking gentleman at a cocktail party remarks “My mistake was going into cosmology for the money.” (Sidney Harris is a long-time contributor to the American Scientist and the New Yorker magazines). Of course, none of us went into paleontology for the money (if you did, you were sadly misled). Nevertheless, the implicit assumption was that after years of college and graduate school, there would be at least a modicum of financial security waiting for us in the groves of academia or the aisles of a museum. The goal of this short essay is neither to give false hope or undue pessimism to eager students now entering our profession nor to prognosticate on the short- or long-term job market. What I do want to do is provide a snapshot of what the current status of employment is among the current generation of American paleontologists and provide a possible baseline for future comparisons. With the help of Cindy Martinez of AGI, I have been able to obtain the original database of paleontologists used in 2007 version of the Directory (names removed). This allows a more detailed picture of the current makeup of the profession than was readily available to Flessa and Smith. The database includes two- and four-year colleges, universities, state surveys, and museums in the United States. Unfortunately, there is no detailed listing for the USGS and most other federal government agencies. Although some data is available for foreign institutions, it is of highly uneven coverage. I have also been able to obtain the membership directory of the Paleontological Society (PS) from Roger Thomas and an analysis of the Society of Vertebrate Paleontology (SVP) membership list by Joshua Blustein that provides further information. In particular, these latter two data sources allow estimates of the number of paleontologists employed in departments of biology, zoology, botany, and anatomy to be made. The AGI database includes paleontologists within eleven “specialty codes” based on self-identification. These are: general paleontology, paleostratigraphy (herein called biostratigraphy), micropaleontology, paleobotany, palynology, quantitative paleontology, vertebrate paleontology, invertebrate paleontology, paleobiology, “paleoecology & paleoclimatology”, and geobiology. The database also includes rank identifications for each faculty members. I have reduced the twenty coded categories by merging similar ranks; for example, lecturers and instructors have been combined, as have adjunct and visiting professors. The “Other category” includes various museum curatorial ranks as well as state survey staff. It should be noted that many of these individuals hold joint or adjunct appointments and thus may occur twice in the database. The single largest subdiscipline in the database is vertebrate paleontology, making up nearly 20% of the total. The large number of adjuncts is quite noticeable, suggesting that many vertebrate paleontologists actually have primary appointments in museums or biological science departments, rather than geoscience departments. A rough estimate of the latter number can be obtained from the SVP and PS membership directories. Both of these databases were queried for “zoology,” “biology,” “biological sciences,” “anatomy,” or “botany” in the department names. There are 665 full members of the PS in the United States; of these, 62 are in biological science (s. l.) departments. Of 1868 non-student members of the SVP (not restricted to the U.S.), 313 are these departments. Given that many paleontologists belong to both societies, and that the SVP count is not geographically restricted, there are probably on the order of 100 professional paleontologists in the U.S. that are not included in the AGI Directory. Other demographic patterns can be obtained from the two membership directories. Of the total of 1064 U.S. members of PS (1435 total members), 210 are students and 175 are of retired or emeritus status. The SVP has 664 students out of total of 2532 members. Student interest in dinosaurs and their ilk remains strong! Returning to the AGI database, I attempted to breakdown the positions by type of institution, based on either institution or department name (Table 2). The categories I used were Museum, University, Four-year College, Community College, and State Survey. It can readily be seen that most paleontologists are employed at the university level. How about the “lone paleontologist” pointed out by Flessa and Smith? 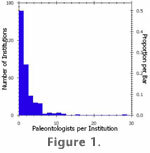 The current distribution of paleontologists at the 349 four-year institutions is shown in Figure 1. Roughly half employ only one paleontologist (mine included). For universities alone, the percentage is 44%, up from the 34% figure given by Flessa and Smith. It is only in museums and a few university departments that large concentrations of paleontologists occur. Where does this leave us? As I point out in a recent essay in American Paleontologist (Plotnick 2007), paleontology as a discipline has numerous strengths and opportunities but has clear weaknesses and is facing significant threats, not the lease of which is the erosion of funding and positions. The issues and suggestions raised a decade by Flessa and Smith remain. Continued efforts to address these issues, by our societies, by high profile paleontologists, such as members of the National Academy of Sciences, and by the community as a whole are necessary.